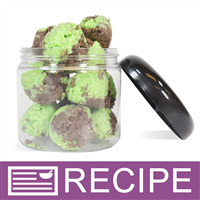 • (1) Ice Cream Scoop - Squeezable Handle - 1.5"
To prepare in 2 large glass bowls, place 8 oz. of cut up soap in each bowl. In 2 small glass bowls, add 8 oz. of Foaming Bath Whip to each bowl. In last 2 bowls, add 16 oz. of European Spa Salts to each. Place one bowl of cut up soap into microwave and heat until soap has completely melted. Add in 8 oz. of Foaming Bath Whip and blend in. If mixture is not completely liquid, place in microwave and heat for 10-20 seconds until liquid. Add Green Mica Powder and mix well. Add 0.50 oz. of Cardamom Mocha Fragrance OiI. Slowly stir in one bowl of European Spa Salts using a long mixing spoon. When completely mixed well, set bowl aside. Taking second large bowl of cut up soap, place in microwave and heat until soap has completely melted. Add in Foaming Bath Whip and blend in. If mixture is not completely melted, place in microwave and heat for 10-20 seconds until liquid. Add Matte Brown Oxide Pigment Powder and Mattte Black Oxide Pigment Powder. Stir well to incorporate color. Add 0.50 oz. of Cardamom Mocha Fragrance OiI. It is best to let product thicken before scooping. It helps the scoops hold together better. If product hardens too much, the bowl can be placed back into the microwave and heated slightly so it can be scooped. Place jelly roll pans on counter in front of you. Using an ice cream scoop, scoop out a small amount of one color and then add the other. Press product gently into the scoop being carefull not to pack too tightly. 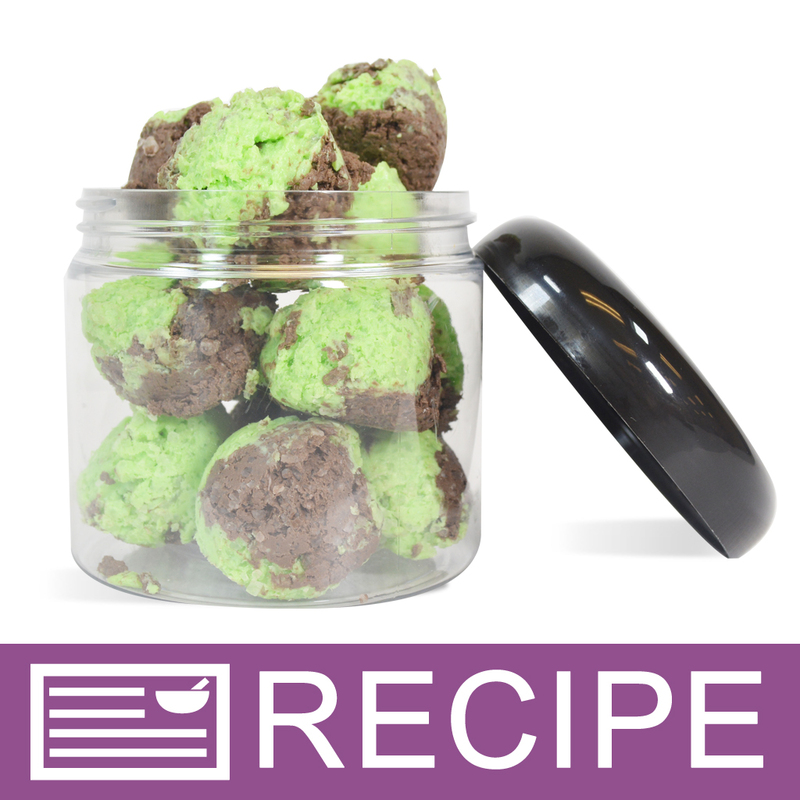 You will get more scoops if they aren't packed too tightly. Place each scoop on the cookie sheet. They can be molded by hand if they are misshapen when unmolded from the scoop. Continue until all product has been scooped. The mixture may need to be heated slightly as it will harden. We were able to get 62 scoops out of a batch. If they are packed tightly, you will get less scoops and if they are packed loosely, you will have more. Let air dry overnight to harden up before packaging. 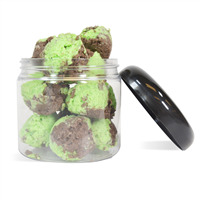 Depending on the size of the scoops, you should be able to fit between 7-8 scoops per jar. Place lid on after filling. To Use: Rub salt scoop into wet skin working up a lather. Pay particular attention to heals and elbows. Rinse with warm water. Ingredient Label: Spa Salts, Glycerin, Water, Sodium Laureth Sulfate, Sodium Cocoyl Isethionate, Myristic Acid, Sorbitol, Propylene Glycol, Disodium Lauryl Sulfosuccinate, Stearic Acid, Sodium Chloride, Sodium Hydroxide, Diazolidinyl Urea, Iodopropynyl Butylcarbamate, Titanium Dioxide, Fragrance, Mica, Chromium Oxide Green, Iron Oxides. "I made these and they are very soft and sticky, did I do something wrong?" Staff Answer These do need to set out overnight to dry and harden. They do not completely harden but will be set enough to package in a jar. Unfortunately, we would not know what might have happened that these turned out soft and sticky. You may need to contact our Customer Service Dept. if you are still having problems.